Quite a few of us have had many bad hair days..
and spring is a pivotal event…Yes! Tim Entwisle, the Director of the Royal Botanic Gardens in Melbourne, has written a book about Australia’s changing seasons, called Sprinter and Sprummer. He bases his seasonal categories on the timing of the plants, the activities of the animals, and the unsettled weather before we move into summer. It is true that much of Australia has no real spring or a very short spring, and not many of the flowers and plants common to the European spring. Paul suggests that we have should have our own season called Sprindy because we do have a lot of windy weather in spring. 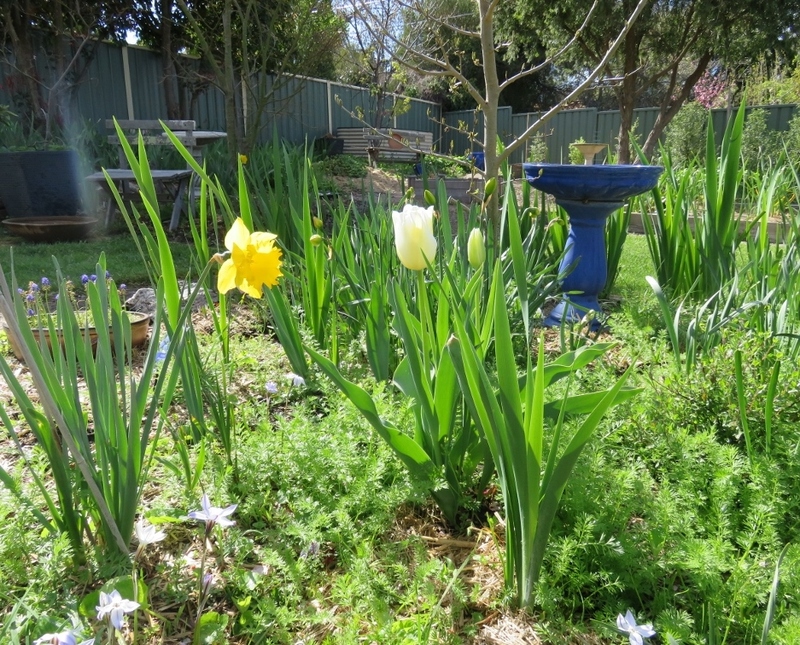 However, during our Canberra spring, we brave the windy, often cold weather , to plant and enjoy English cottage garden flowers like Jonquils, daffodils, aquilegia, tulips, Iris. Many flowers only come out in late spring, (November) and then we can smell summer in the air. However, during the spring and summer the real stars of the garden are not the pretty spring bulbs and flowers, but the flowering long lasting, ”foot soldiers” of the garden. I’m coming to appreciate them more and more. For example.. 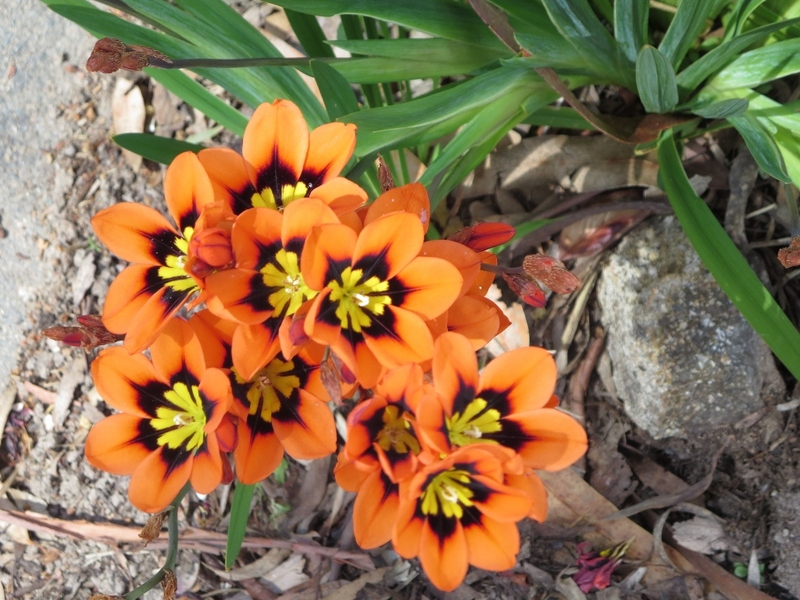 The Orange Sparaxis, grows in poor soil and has survived through drought and wind and rain. 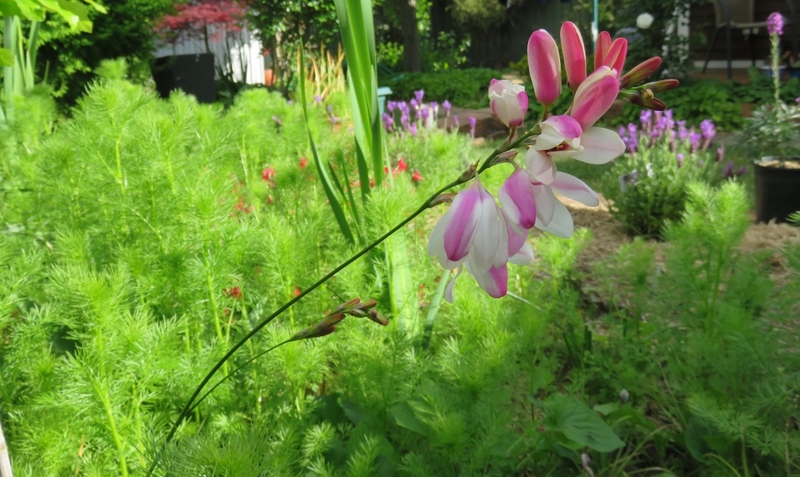 They are striking to look at, and these flowers, right by the walkway, are often admired by passers-by. 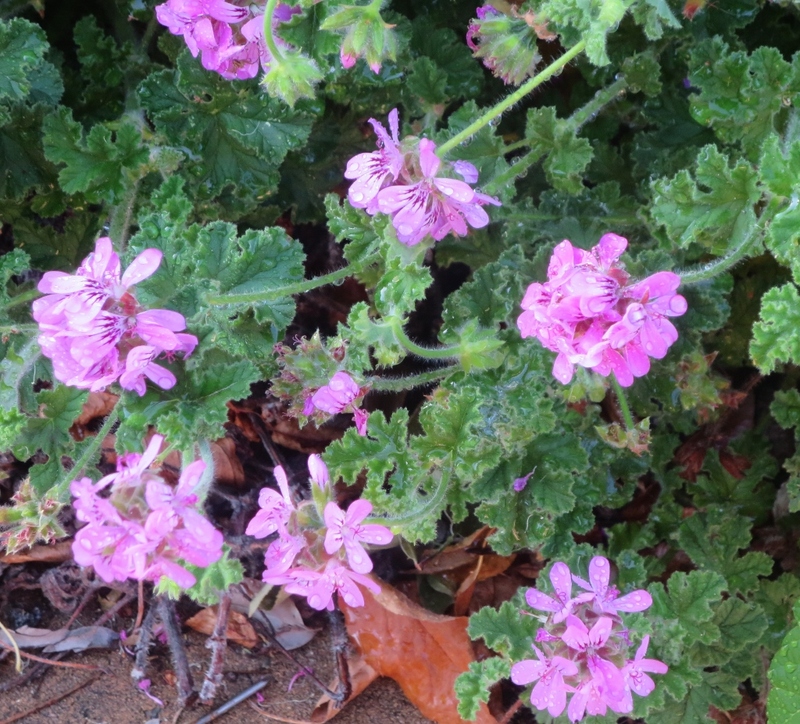 This is a Native Geranium ground cover, which will flower and flourish in all conditions, and brings the bees. I have seen a photo of a Geranium just like this called Wild Geranium on Jason and his wife Judy’s great blog called garden in a city . 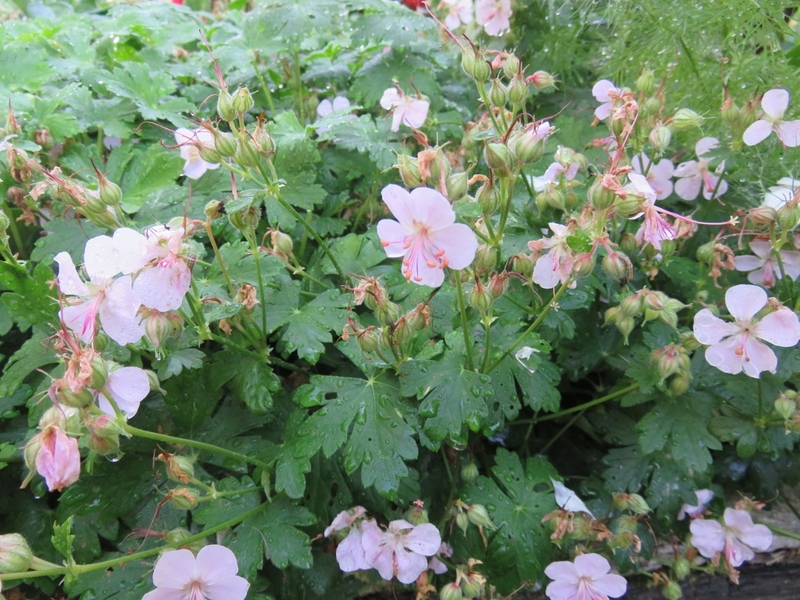 The Lemon-scented Geranium is another plant that tolerates almost any conditions, and brings the bees and the butterflies too. Another foot solider. 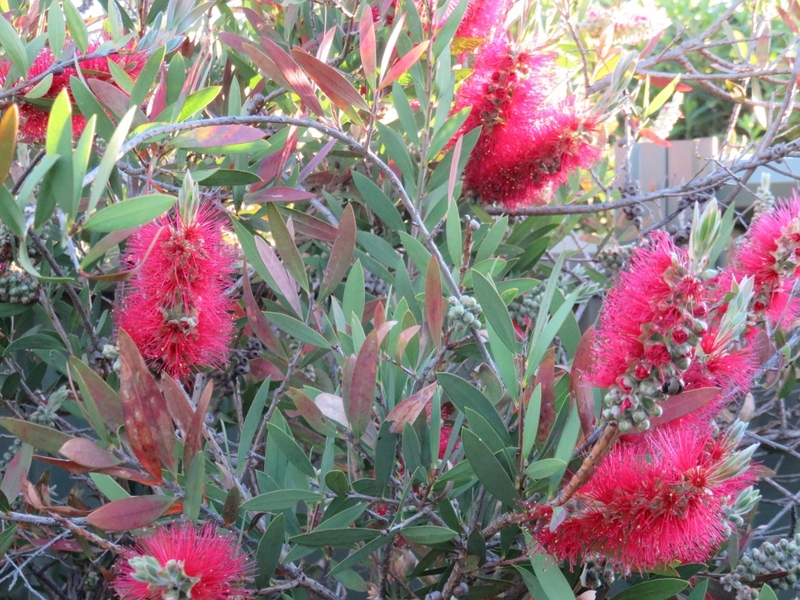 We have three Bottlebrush bushes in our garden, but this one deserves a special mention, for hanging in there, behind the cabin for many years. The winter and spring rain have made it sit up and take notice and it is lovely to see its flaming red colour across the garden. 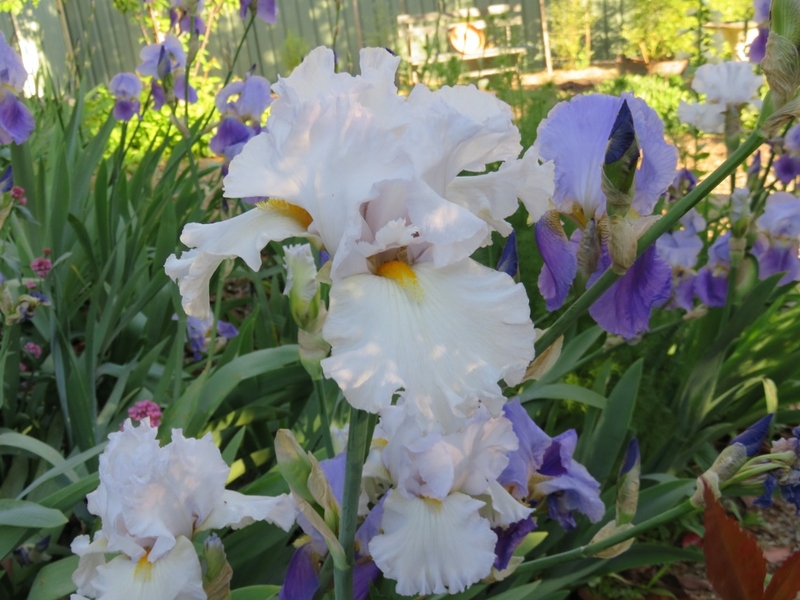 And now for my spring change of heart……the Iris is lovely, but……. here today, and gone tomorrow. In autumn I spent ages re-planting the Iris into this part of the garden, and very soon the plants were leggy and falling over in the wind and rain. We were away for a week, and the flowers had died off, and the weeds had taken over. Enough already! In autumn we will dig them up, and keep a select few and replace the rest with the hardy native plants. Of course I’ll always grow some spring flowers, they are such a joy and sign of hope in a garden. 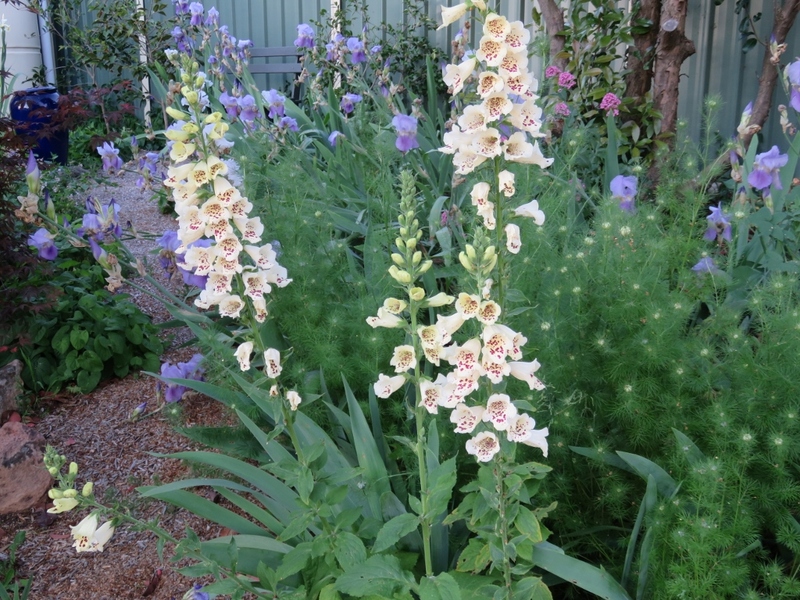 As Peter Cundal, the previous presenter of Gardening Australia, said one day, as he bent over a some spring plants..
..and I feel exactly the same way. This has been a big week for our family, as my older brother had a long and serious heart operation and is now successfully recovering. He is a dedicated reader of my blog, and is extremely knowledgeable about birds and plants. He lives in a beautiful part of the world (Port Macquarie) with no winter or sprinter, and I know he will be glad to be back there very soon, and I look forward to him being well and able to enjoy his own green spaces again. Copyright Geraldine Mackey all rights reserved. 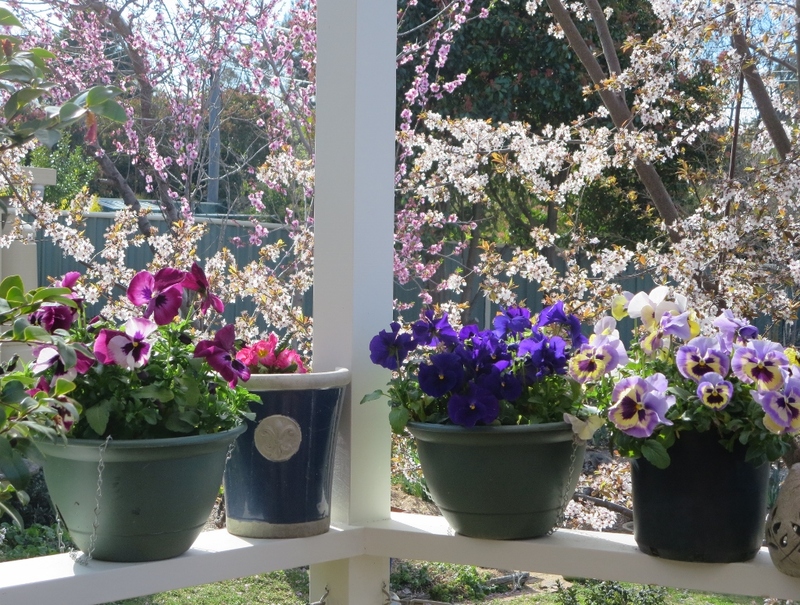 This entry was posted in Canberra's Suburban Gardens and tagged Bottlebrush, Brindabella Mountains, bulbs, Canberra, cockatoos, gardening, geranium, Iris, Lemon scented geranium, native geranium, Sparaxis, spring, summer, weeding, wild geranium on November 27, 2016 by germac4. It has been a strange spring. Love the suggestions for additional seasons. Thanks for sharing the lovely photos. Ye, I agree, a very strange spring! Wonderful flower pictures, hope you continue to get the much needed rain. I loved the mountain view too, so atmospheric. Thanks Susan, the mountain photo was taken from our garden. Oh dear, I do so envy that you can grow such a profusion of flowers. I am a bit over eternal tropical green & yearn for a few pots of pansies (or anything really) up here in the far north. Well, it is good to be reminder of that, down in the south, on a cold day! He is pretty cute and makes us laugh quite often! in recovery mode here too. Wishing for a brisk return to full health for both of them. That bird has feathers that look like whipped cream or meringue. I thought you hadn’t written a post for a while! Best wishes for them both in recovery. 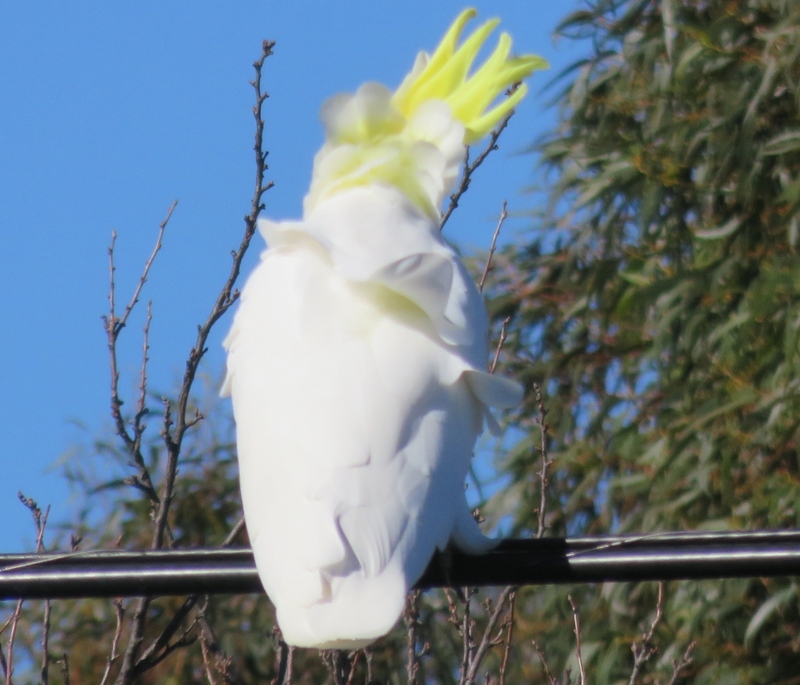 Yes, you are right, the cockatoo’s feathers look just like whipped cream! 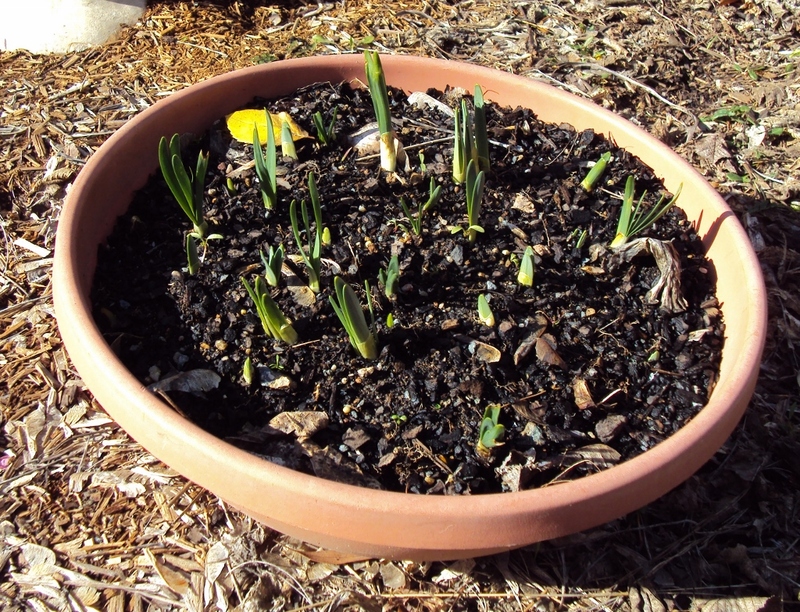 Yes, things are going well….I really love those orange Sparaxis too, and they grow like a weed! I absolutely love the Orange Sparaxis – fantastic color! I would plant it here if I could. Here in Chicago winter typically runs from late November to the late March. The orange Sparaxis are very striking .. Even better than the photo suggests. Good luck with your long winter. Best wishes for a speedy recovery for your brother. You must be relieved that the operation is over. I am so jealous of your blue skies at the moment; really missing Australia right now. Lovely to see all the colour in your spring garden. My brother is recovering well Janna, thank you. It is always lovely to have blue skies, I agree, just a pity it comes with the summer yellow look rather than green! Thanks Sylvia he is on the mend. Yes windy days are a nightmare for us all! Well, this is perfect! I can read your ;posts and enjoy such spirit-lifting spring flower photos while I’m enjoying the snow and cold of our winter! How gorgeous it looks! Thank you for these…they get my gardening mind working overtime. It’s also great to hear your rainfalls have been more pronounced this year: hooray! Trying to comprehend spring in November and winter in (what I know as) summer hurts my head: it’s like trying to learn a new language! 🙂 Good for the brain, if trying. 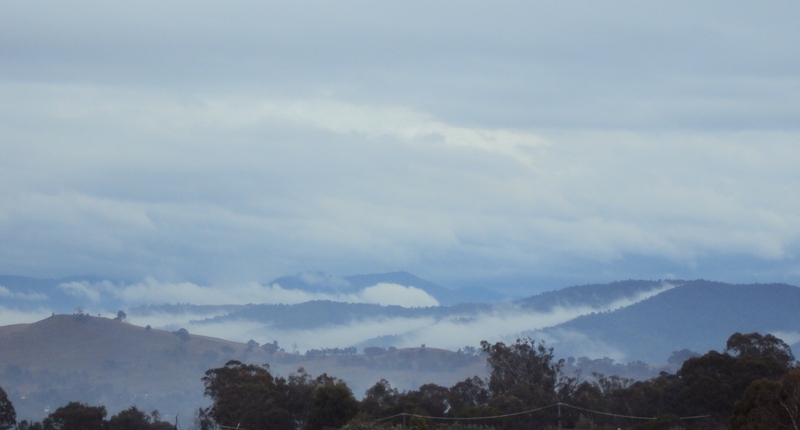 But the flower photos and those gorgeous Brindabella Mts…so soothing! Blessings on your brother’s return to good health, and gentle peace to you. Well, this is perfect! I can read your posts and enjoy such spirit-lifting spring flower photos while I’m enjoying the snow and cold of our winter! How gorgeous it looks! Thank you for these…they get my gardening mind working overtime. Thanks Kitty, and it is lovely to follow your posts with all the snow…while we get ready for the hottest part of our summer!! It is a nice reminded of all the seasons all over the world.